How were you introduced to the sport of dragon boating? 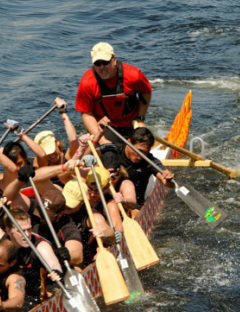 In 2004 the Tampa Bay Dragon Boat Races had their inaugural event and the company I worked for at the time, CP Ships, was one of the sponsors. The company wanted to support the event and did so by organizing a number of teams. The CP Ships Marine Marauders competed and from that day forward I was hooked. It was internal competition between various departments as well as teamwork and camaraderie at its finest. At its peak, CP Ships had 5 teams competing in the event and close to 150 people on rosters. What made you decide to take it to the next level? 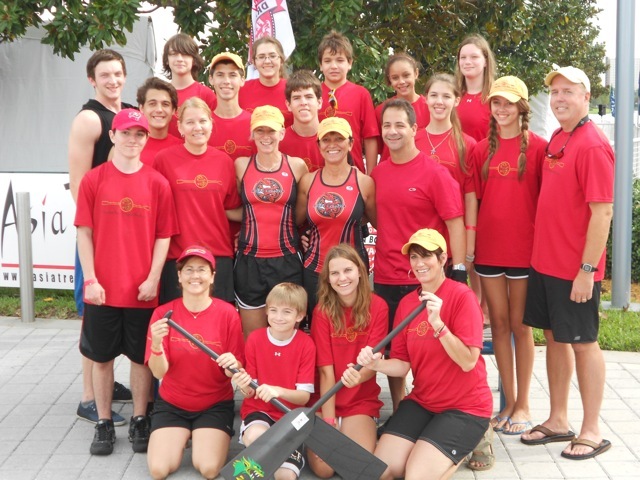 After the 2005 races, the Tampa Bay Dragon Boat Club was formed as one of the first clubs in Tampa that was open to anyone. I chose to become a "plank owner" in the club to work, train and paddle with other like-minded individuals, and dedicate the time and effort into developing a club team that could compete in the Nationals that were scheduled for the following year. To this day I am a member of the Club and enjoy their competitive spirit and extreme passion for dragon boating. Why did you transition from paddling to steering? It started out very innocently as my corporate team and the Club would be in need of a steersperson to run practice. I continued to paddle, then steer, but really came to enjoy steering and running practices. My first races were in 2006 and I had the honor and privilege to steer the Pink Dragon Ladies and Tampa Bay Dragon Boat Club at the 2006 Nationals. One word comes to mind when steering the 'Pinks' and that is 'inspiration.' Tampa is truly blessed to have a cancer survivor team. Steering a race is nerve racking and an absolute rush at the same time. Understanding race strategy, race tactics and pushing people to their physical limits and beyond is extremely rewarding. Additionally, through recommendations and referrals, I have been given the opportunity to steer and train corporate teams across the country at numerous festivals. It is an awesome feeling knowing you have helped a community in an event that raised money for a local charity or institution, and having introduced many people to the sport of Dragon Boating. Without a doubt it is the development of a youth team in Tampa. With some of the best water in the country and ability to practice year round, it was shocking to realize that the closest youth team to compete on a regular basis was located in Philadelphia, PA. In 2011, the Dragon Riders started racing and have not stopped. The team continues to grow, albeit slowly, and is open to anyone from age 12 to 17. We are always looking for new paddlers and we look forward to building a regional force of youth paddlers and some day having Tampa youth qualify to participate with Team USA. What is it like to coach a youth team? The Youth Director within TBDBC acts like a complete executive committee and support committee unto itself, so you could say we are a club within a club. As such, this role with the club is challenging and rewarding. Attracting and holding on to youth once they start to paddle has been a challenge as we are competing with so many other activities in the Tampa Bay area, and the parents must commit tot he practice and race schedule as well. On the financial side, we are blessed to have received individual and group donations that have helped defer costs, received discounts from numerous organizations, and in one instance received a grant to purchase equipment, but there is always a need for additional support. Finally, after coaching and training the youth to the best of your ability, there is nothing more rewarding than watching the reaction and sharing the experience and moment with the youth when they perform well in a race and cross the finish line in front of adult teams. Their excitement, energy and enthusiasm is infectious. David Nelson is a member of the Tampa Bay Dragon Boat Club, and can be contacted by interested parties at youthdirector@tbdbc.com. 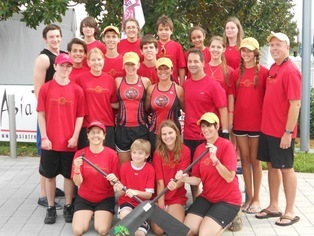 David Nelson (right) with his Dragon Riders youth team at the Orlando International Dragon Boat Festival 2011.